Lead Us Without Changing Us! What a day it has been, First I was confronted by a delegation from one of the organizations I lead. They want me to continue leading them, but only if I do it their way. Doesn’t really make sense, because they don’t need me if I do it their way. Then I get back to my office and my Internet connection is broken. I tracked it down to some wires and switches. However, I just didn’t have the energy to figure out which wire wasn’t plugged in correctly to the switch. Someone had been messing with it and I just didn’t care. On the way home I was praying that I could get out on the water. I was thinking about taking my family out on the canoe, but that just seemed like a lot of work. I was thinking about going out alone, but that too seemed like a lot of work. Just then the phone rang! It was my friend Vern. He owns the computer repair shop right next to the Columbia County courthouse in St. Helens. In addition, he gets out on his kayak about 5-6 times a week. He wanted to know if I wanted to go out. Perfect! We met under the Lewis and Clark Bridge, the one that joins Rainier to Longview over the mighty Columbia River. Now I’ve not been in a kayak since I spent two weeks in one on Glacier Bay Alaska – in 1991! The delegation that confronted me was an interesting bunch. They want me to wear a tie, and coat when I meet with them. They want me to keep their traditions, but they want to grow. They don’t want me to do anything to make them feel uncomfortable, but they say they’re ready to change. It would be funny if they weren’t so serious. I told them that I may not be the right guy to lead them. They wanted to meet again and have me bring a written statement of my vision for them. I said no. They aren’t ready for what I have to tell them. Nevertheless, by the end of the conversation (which turned out well, despite the one saboteur, I was feeling spent. I just wanted to escape. So I put off the big projects that needed doing, and just focused on small, procrastinating tasks. I forgot just how much I missed the water until I moved back to Oregon. I forgot how cool our big rivers are until getting close to them – in a canoe or kayak. We saw some cormorants, a pair of eagles, some osprey, and a the remaining splash of where a beaver took cover as we passed. And then, when we were about a mile or so from where we put in, the sun had gone down. So we stopped to mount our lights. That’s when we were approached by Federal Security officers in a boat. 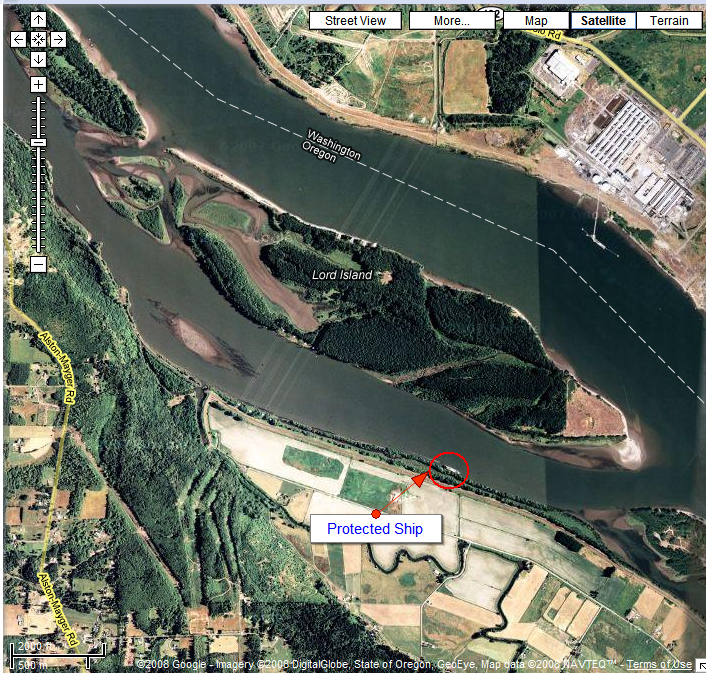 They told us we had to stay 500 yards from the ship along the shore (see diagram). When we completed our six mile loop around Lord Island, I was sweaty, exhausted, and cleansed. I needed that little ride. There is something about the gentle lapping of water on the hull of the boat. There is something incredibly peaceful about listening to the breeze blow through the ubiquitous cottonwood trees on the banks of the river. That combined with the sunset and beautiful crescent moon. They all conspired to speak peace into this ravaged soul! This reminds me of our work with young families. Despite the fact that parents “need” our “Parenting Education” program, we enter with the assumptions that “The Parent is the Expert on his/her child” and “All parents want to do well by their child”. The reality is often that they are challenged to use those strengths and so we join them to understand how best to support them. The fact that this group has asked you to be with them is a real strength. It is also great that you have recognized that their words ‘we’re ready for change’ and their caveat ‘on our terms’…seem incongruous. It feels like the are really disorganized in their thinking and I wonder how their strengths could be used to support them through their disorganization….hmmm? Thinking. Praying. I thought it important to note that these assumptions come from our work with Dr. T. Berry Brazelton and his work in developing the Touchpoints Approach to working with children and families. I have had the pleasure of learning from Dr. Brazelton and his team over the past two years in becoming a Touchpoints Facilitator. His Guiding principles and Assumptions are at the core of our work.